It’s difficult to remember now which came first, fiscal insanity or monetary madness. But we have indeed reached the point of such abject stupidity – at both ends of the Acela Corridor – that nobody even knows that money can’t be free. Everyone fears an itsy-bitsy interest-rate hike. And they all peddle bogus theories about why something inexplicable by all traditional canons of sound money is perfectly rational and appropriate here and now. Keynesians blather about an invisible benchmark called the “r-star,” or the “neutral rate” of interest. Supply-siders batter a bogeyman called the Phillips Curve. Wall Street and Bubblevision just worry about “tightening” conditions, widening risk spreads, and falling stock prices. The facts mock these self-serving rationalizations. Let’s look at some numbers. The “effective” federal funds rate is 2.41%. Right now, traders say the Fed’s “target range” is 56% likely to be cut from its current 2.25% to 2.50% before year’s end. And yet it’s just 25 basis points above the 2.15% inflation rate. If we price in the wacky 50 basis point cut Stephen Moore says we need, it’d be back in negative “real” territory. That’s where it was for 123 months running before November 2018. Look, there’s no chance in hell that a money-market rate just 25 basis points above the inflation rate could possibly harm the Main Street economy. Let’s say that December increase were fully passed through to consumers. It would amount to a hairline difference in the current 4.78% average rate on a 60-month auto loan. It would have a similar impact on the current average 30-year home mortgage rate of 4.29%, the average prime rate on business loans of 5.5% and the average credit card rate of 17.7%. It would cost shop-until-they-drop consumers just 1.4% more to use their plastic. So, I don’t think it would it slow down the “proceed to checkout” clicks on Amazon.com by one bit. When we talk about the cost of money to real borrowers on Main Street, the Fed’s December increase is a rounding error. And so, too, would be another 50- or 100-basis point rise in the money market rate on top of that. From 1994 through 2000, the federal funds rate averaged far higher. In fact, at 4.8% it exceeded the average core Consumer Price Index (CPI) rate of 2.55% by 225 basis points. The money market spread over inflation – that’s the “real” rate – averaged 10 times what Moore claimed to be the “inexplicable” level resulting from the December increase that caused Wall Street and Bubblevision to join the Tweeter-in-Chief, stomp their feet, and scream for relief. Back in the 1990s, a meaningful return on liquid savings over and above the cost of inflation and taxes didn’t bring down the economic house. Real GDP growth, in fact, averaged 3.5% during the period. The brown line represents the “core” trend for the CPI. Basically, that’s prices paid on Main Street for most everything except food and energy. 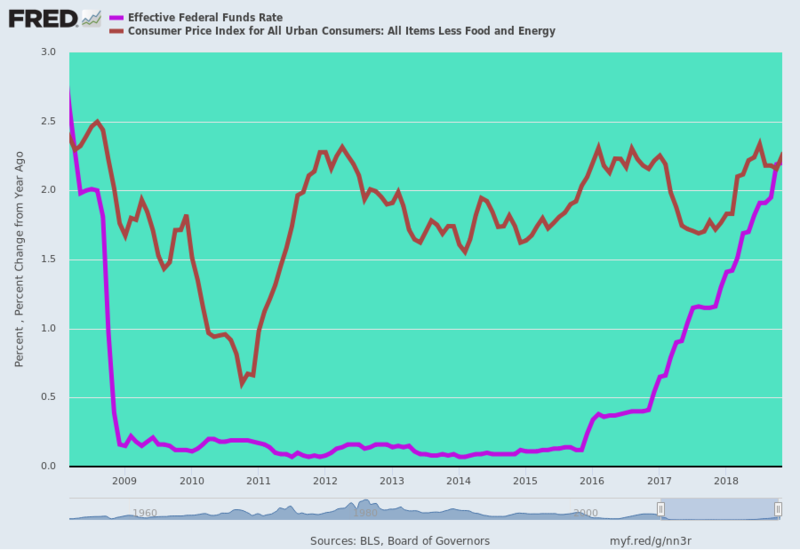 The purple line represents the effective federal funds rate. The fast expanse between the brown line and the purple line amounts to a speculator’s heaven. Wall Street traders were able to put on margin or option positions with 90% or better leverage because borrowing to do so cost less than the going inflation rate. This is a picture of what happened. All factors below are based to 100 and measured from December 2007. The purple line represents gross national product. That’s the total value of goods produced by and services provided in a country during a given year. It’s roughly equal to gross domestic product plus net income from foreign investments. The red line represents total business sales. This includes overall output from manufacturers, retailers, and merchant wholesalers. 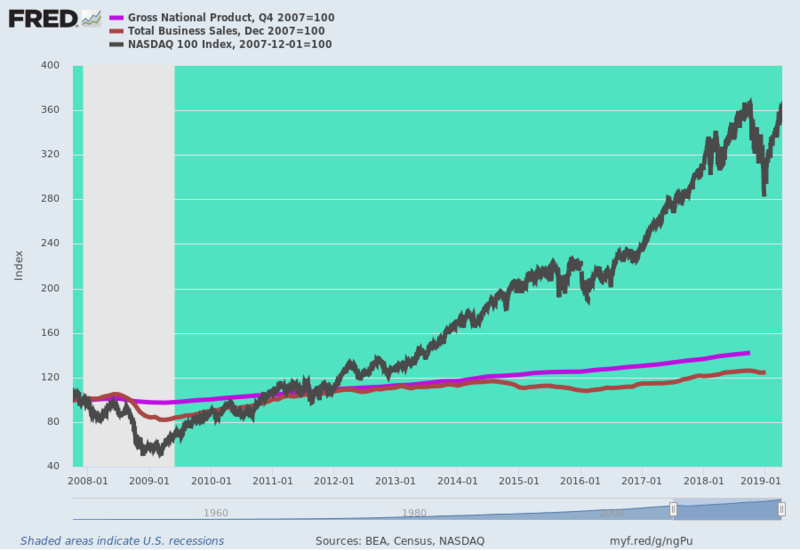 The black line represents the Nasdaq 100 Index. It’s based on the top 100 domestic and international non-financial companies listed on the Nasdaq Stock Market. All policy from Imperial Washington – fiscal and monetary – is geared toward Wall Street. It’s a massive subsidy for speculation, at Main Street’s expense.